Caucuses and closed primaries empower the most dedicated activists and partisans at the expense of the inclusion of most American voters, and they end up driving election results that are not representative or truly democratic. We must kill caucuses and open the primaries to encourage full participation and ensure that the candidates we nominate for the general election are the ones most voters would have chosen. Caucuses are high barrier nominating contests that prevent people from all backgrounds from being able to participate. They reward the most privileged and over-represent those on the political extremes. Closed primaries disenfranchise the growing group of political Independents, who have no say in who appears on the general election ballot. They essentially say that partisan voters deserve to vote twice, while nonpartisans only get to vote once—a clear violation of the principle of one person, one vote. Promoting open and semi-closed (more on the distinction between these two below) primaries over caucuses, conventions, or closed primaries is the clearest way to ensure everyone has a say. And these primaries should be coupled with other voting reforms to make sure they are truly open to all. In the 2016 Democratic presidential nominating process, 14 states and four territories held caucuses.1 But not surprisingly given their high bar to entry, caucuses tend to have extremely low turnout. According to data from the United States Elections Project, the average 2016 caucus had turnout about 20 percentage points lower than the average 2016 primary.2 One striking example is the 2016 Washington Democratic Presidential caucus. In that election, about 230,000 people voted in the caucus that awarded 100% of the state’s voting delegates to the Democratic National Committee Convention. But Washington also holds a Presidential primary that the Republicans use to allocate delegates, while the Democrats don’t. The state still held this non-binding primary election for the Democrats, and with nothing else on the ballot, over 800,000 people voted in the meaningless primary.3 That is how exclusionary caucuses are—more than three times the number of people showed up to vote in an easily accessible but meaningless primary than participated in the restrictive caucus that actually counted. These smaller numbers can lead to unrepresentative results as well. In 2016, the candidate who won the lower attended caucus by a 73% to 27% margin ended up losing the higher turnout primary by a 48% to 52% margin—a 25 point drop in support. According to data from the United States Elections Project, the average 2016 caucus had turnout about 20% lower than the average 2016 primary. One of the starkest examples is Minnesota. Minnesota was a “Super Tuesday” caucus state in 2016, but it has generally good voting laws and is known for high voter turnout. In the 2016 general election, Minnesota ranked 1st in the country with nearly 75% turnout. Yet in the same election cycle, its caucus couldn’t even break the top 40 in turnout among Democratic nominating contests, and it boasted a measly 8% turnout combined for the Democratic and Republican caucuses. Almost three million people voted in the general (2,968,281 to be exact), while only 321,354 voted in the caucuses—a 2.6 million person difference. 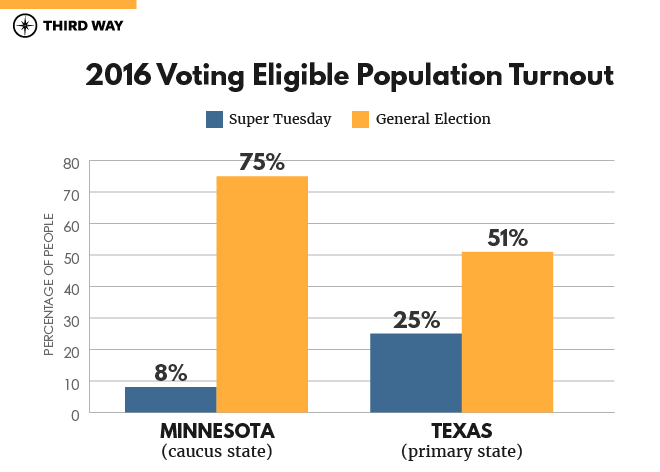 To put that in perspective, Texas was a “Super Tuesday” primary state in 2016 and saw much better turnout. Texas actually ranks near the bottom of turnout in the general election with 51%, but its combined presidential primaries held on the same day as Minnesota’s caucus had a 25% turnout. This shows how much caucuses can decrease voter participation even in a state with high-propensity voters like Minnesota. These contests often suffer from abysmal turnout because they are so restrictive. The barrier for entry is usually that an individual has to be able to attend a meeting at a certain space at a certain time and remain there for several hours to cast their vote. Caucuses also require people to vote publicly in front of their friends and neighbors—directly contrary to the notion of a secret ballot. In the end, they only embolden the most passionate at the expense of the average voter. Caucuses also actively discriminate against college students who are registered at their parents’ houses rather than their dorms, the working class (who are more likely to be working at nights or on weekends when caucuses are typically held), parents, active-duty military, those with disabilities, and seniors with limited mobility.5 In short, they operate as voter suppression by another name. There’s another related problem, though one that is much less common now. Some states also hold nominating conventions that are similar to caucuses. Virginia has the worst such system at this point, where the parties can decide to simply cancel a primary and hold a convention in which local party leaders serve as delegates and get to officially pick the nominees instead of holding an election in which voters can participate. Virginia is the only state left with this extreme version of a convention system. In other states, like Massachusetts, if a candidate gets a certain percentage of the delegates at a convention, they are considered the official nominee, and the primary is cancelled. There are still about a half dozen states that hold pre-primary conventions, though they range from ones that can cancel primaries to ones in which any candidate can still petition their way onto a primary ballot, but convention winners are still given preferential treatment. Like caucuses, these contests are undemocratic and give party leaders and activists the ability to override the will of the voters. Unlike caucuses, primaries are contests that are usually funded by taxpayers and are used to winnow down several major party candidates to just two options in November. Parties should want, and citizens should demand, greater input and access for voters in these contests—because more involvement on the front end means better choices that appeal to a greater swath of Americans by the time we get to November. The swing state of Pennsylvania holds closed primaries, and 14% of voters are not registered with either major party. That means nearly 1.2 million Pennsylvania voters are turned away from voting in the primary elections that will choose their candidate options in the general election. So how would we pick nominees if we killed undemocratic caucuses, conventions, and closed primaries? States would have two different options, depending on how they handle their voter registration process. In states with no registration by party, any registered voter could participate in either party’s primary, but they must choose a single ballot when they walk into the primary. This style of “open primary” is already very common in states that don’t make voters register by party—in fact 20 states currently use open primaries for all primaries. In states where voters already register by party, primaries could shift toward either an open system or to semi-closed primaries, which are currently used by more than a dozen states. In semi-closed primary elections, voters who are registered as Democrats can vote in Democratic primaries and voters who are registered as Republicans can vote in Republican primaries. Registered Independents are allowed to vote in either party’s primary by declaring which ballot they desire on Election Day. In states that allow for people to register with a minor party such as the Libertarians, those party members would participate in the nominating process for those parties. In these states, the benefit of registering with a party is that only those individuals can hold party positions, such as a precinct chair, or serve as delegates to party conventions that oftentimes set party rules and platform. Independents are forgoing their right to participate in party business but in exchange get the right to participate in whichever primary they desire, while partisans can be leaders in their own party, but they give up the right to vote in other parties’ primaries. Some prefer the semi-closed system because they worry voters from the other major party may try to meddle in a primary, attempting to nominate the person they think they can beat instead of the person they actually support. But both methods solve the problem of disenfranchising Independents and are wildly more democratic and representative than closed primaries, conventions, or caucuses. It’s time to kill these exclusionary systems in favor of creating primaries for every nominating contest and making sure that every voter has a primary in which they can participate. Parties and states could make those changes swiftly, and many have already begun to move in that direction. Half of the states that held caucuses in 2016—Colorado, Idaho, Maine, Minnesota, Nebraska, Utah, and Washington—have officially switched to primaries in 2020, which means that only seven states and four territories are set to hold caucuses in 2020. This movement happened both at the legislative level and state party level, as many state governments had to create and fund new primaries, and all state parties had to opt into these new contests. In the seven remaining states, seven would require state legislative action. The Democratic National Committee has been a major force in this push as they are now strongly urging states to allow for more democratic practices such as early and absentee voting. Many of the remaining caucus states such as Alaska, Hawaii, and North Dakota are looking at caucuses that would allow more democratic practices such as early mail voting, and even first-in-the-nation Iowa is likely to allow excuse-required absentee voting. These changes are not sufficient but a positive step in the right direction. The federal government could also entice states to switch from caucuses to primaries by offering grants to help them move to a more fair system. They could also potentially mandate that every voter be allowed to vote in every federal election as a way to end conventions and closed primaries. However it gets done, we need to do it, because caucuses, conventions, and closed primaries are legal forms of voter suppression that we should relegate to the dustbin of history. We believe that the American election system places too many burdens on voters, and that the government should do more to proactively ensure every voter has their voice recognized and counted. Ending caucuses and closed primaries is a good first step in tearing down these restrictive barriers and making sure our representative democracy better represents the people it is supposed to serve.